Edmonton, Alberta – Pizza Perogies are here! 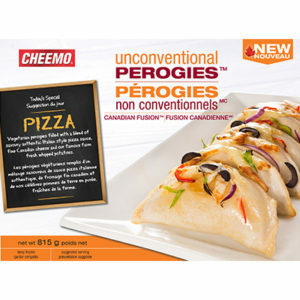 Heritage Frozen Foods Ltd. is adding a second flavour to its CHEEMO Unconventional PerogiesTM brand –Pizza. The pizza perogy follows up on the successful launch of the South Asian Style Curry perogy which is available to consumers across Canada. The Unconventional PerogiesTM Pizza is a vegetarian perogy filled with a blend of savoury authentic Italian style pizza sauce, fine Canadian cheese and CHEEMO’s famous farm fresh whipped potatoes. “For over 46 years our family has provided Canadians with high quality, great tasting perogies at a reasonable cost,” says Joe Makowecki, President of Edmonton-headquartered Heritage Frozen Foods. Heritage Frozen Foods is a Canadian family-owned and operated company proudly using wholesome ingredients grown by Canadian farmers. It has been providing its customers with high quality value-priced perogies since 1972. For great CHEEMO recipes, visit www.cheemo.com.